Location! Location! Location! The Shores is located mid-island, directly across from Publix Super Market! Park your car and ride the entire length of the island on our local trolley! The trolley stops right in front of the building! Plenty of shopping available, just a few miles away, in either direction, at Times Square or Villa Santini. Restaurants abound! If you enjoy shelling, relaxing in the sun, and breath-taking sunsets, this is the place to be! The Shores offers beautiful sunrises and sunsets from the ocean front deck with tiki huts and lounge chairs, for your enjoyment. You are, literally, just a few feet from a gorgeous, white-sand beach and the beautiful blue waters of the Gulf of Mexico! Grounds are beautifully landscaped with palm trees, seagrapes, and other tropical foliage. For your convenience, The Shores has under-building parking, an elevator, and a coin-operated laundry facility. All condos at The Shores are one bedroom, one bath, and have views of the ocean from the living room and bedroom lanais. This condo is the largest unit offered, and has just been updated with new ceramic floors, window treatments, and new furniture. It is a top floor unit (there is an elevator) for 1 or 2 persons. The new decor is a delightful Floridian style. The views are fabulous from both the living room and bedroom. The kitchen is fully equipped with full size appliances, including a refrigerator with icemaker, range w/oven, dishwasher, and a microwave. All the cooking and serving utensils are there, to make your culinary endeavors less challenging. Small appliances include, a coffee maker, toaster, blender, and mixer. The bedroom has a King size bed and a walk-in closet. The bath/commode area has a walk-in shower w/sliding glass doors. There is a separate vanity area. TV's in both Living Room and Bedroom. All towels,beach towels, and linens are furnished. Free Wifi, cable TV, and long distance calls (within the USA or Canada.) No Smoking. No Pets allowed. Great location. Nice, smaller complex. Unit could have been cleaner and parts need updated. We had a wonderful stay. Great people , fabulous beach steps away. Unit wasn’t the cleanest. Thanks for taking the time to review. Can you please let me know, and please be specific, as to what you felt needed to be cleaner? I take this very seriously. I have never received, until now, a complaint re the cleanliness of any of my units. I'm happy you enjoyed your stay! Nice clean apartment, nice views, all local amenities, could not ask for better. My husband and I were celebrating our 25th anniversary and stumbled across this unit. It was clean, nicely decorated and right on the beach! There was a Publix directly across the street which was super convenient! I would recommend this place to anyone! So glad you enjoyed your stay - congratulations on your anniversary! Hope to see you, again, soon! The apartment was nicely furnished as online photos reflected. It was very convenient to walk down the steps and quickly get to the sand.There are lounge chairs close to the beach as pictured in the ad. The only thing is, they are all strapped down so you must remain on the elevated concrete patio as opposed to moving/using the chairs on the beach. ( we think it's probably so they don't fly around in a storm and/or get stolen) There is a publix grocery store directly across the street which is very handy. There were a few minor signs of deferred maintenance such as a screen door off the track, but not a big deal. Because the apartments are only set up to accommodate 2 guests, it was very peaceful. My husband and I were looking to relax, so in that regard ,this place really delivered. I checked with Karen to see if we could get in a bit earlier and she graciously accomodated us.We would definitely stay here again. Very nice condo and a great location on Ft. Myers beach! Great location across from Publix (very handy when buying groceries). Condo was clean and very nice, just perfect for us as a couple. Condo was furnished with all we needed for the week (would have liked more than 2 beach towels, tho). We were informed by other guests of the storage unit on the 1st floor where there were additional beach chairs and other items to use (suggestion to add that to the "instructions" letter). We thoroughly enjoyed our stay at this condo! We love it here. This is our 6th or 7th year. We hang with the same friends every year and enjoy the beach and relaxing quiet peaceful area. Many places to visit and walk. A real get-away! There are a lot of activities & attractions to enjoy in the Ft. Myers Beach area. The choices are endless! Golf courses are nearby. Fishing charters are available, there are parasailing, jetskiing and other water activities for hire, bike and scooter rentals available, dinner and gambling cruises daily from the pier, and tours available for everything from Edison's home to air boats in the Everglades! You may prefer to just relax and listen to the ocean, just outside your door! Whether your pleasure is sightseeing, sunning, swimming, shopping, shelling, golfing, going to a movies or play, having a delicious dinner in a great restaurant, sipping a cool drink as you relax under one of the Tiki huts, or just watching a fabulous sunset -you will never tire of this little hideaway on the beach! You can do something, everything, or absolutely nothing at all! 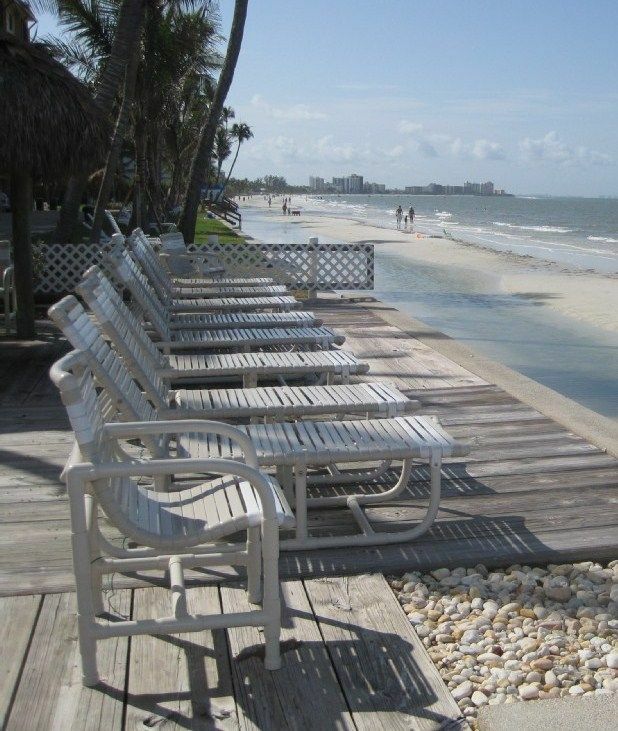 You are on vacation at Ft. Myers Beach! This is paradise!